Yesterday afternoon I led our local writing group. The members of the group, called Writer’s Studio, free write for about twelve minutes in response to a writing prompt. When we’re finished, those who choose to read what they wrote. Once everyone has shared, we write again. I thought I’d share the writing prompts I used. We celebrated both Halloween and Dia de los Muertes this week. Either write about a memory associated with the holiday of your choice, or concoct a scary story. Be sure to include dialogue. If you are stumped, try writing about Halloween from the point of view of a costume, or — here’s a “sweet” idea — from the point of view of a piece of candy. 2. Use a physical object to inspire a story. After putting out some random objects on a table (a small teddy bear, rocks, paintbrush, glove, toy cars, etc. ), I talked about how an author used real objects to get a story idea. In a webcast few years ago, Kate DiCamillo discussed writing her award-winning children’s book, Flora & Ulysses: The Illuminated Adventures. She revealed two of the main elements in the book came from real objects, each of which had deep emotional impacts on her. The squirrel in the book was based on a real squirrel who had showed up on Kate’s front porch. She said it was sick, so she called a neighbor for advice about what to do. The neighbor suggested a method for dispatching it (which I will not repeat here.) Fortunately, the squirrel left the porch on its own. Sympathy for the squirrel’s plight made her remember the event. The second item was a vacuum cleaner that Kate saw whenever she entered her garage. The vacuum cleaner had been her mother’s and her mother had recently passed away. Again, it was an object that elicited strong emotions. Stories are always best with some underlying conflict. In the book, the two real life objects came together as a vacuum cleaner sucked up a squirrel, leading to some unexpected consequences. Be sure to incorporate conflict into your story. The Pillow Book by Sei Shonagon and Meredith McKinney (Translator, Introduction) inspired our final writing exercise. Sei Shonogan was a Japanese writer/poet who lived around the year 1000. People still read a collection of her writings called The Pillow Book. In the book, many of Shonogan’s poems take the form of lists. A boat with its sail up. 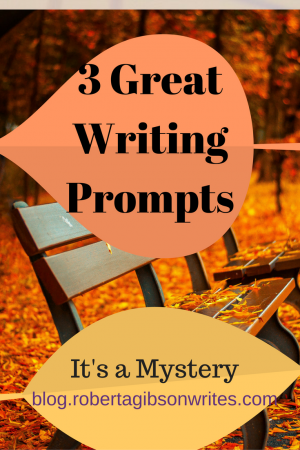 Let us know if you use any of these writing prompts. Have you ever tried writing prompts? They can be helpful in all sorts of ways, from writing your way out of writer’s block to keeping your writing sharp when you are between projects. If you like to have everything planned out when you write, using prompts might help you loosen up and become more spontaneous. Plus, you never know where an idea might take you. Today I’d like to share the writing prompts I used with a writing group at our local library. The first writing prompt came from Writing to Change the World: An Inspiring Guide for Transforming the World with Words by Mary Pipher (around page 33, depending on the edition). Mary Pipher describes a project to write a poem by starting each new phrase with “I am from…” Although designed to be a project to reveal things about yourself, it would also be equally useful to write from one of your character’s point of view, for a character study. Garden fresh tomatoes and green peas. For the second writing exercise I read a bit of Elizabeth Berg’s section about plotting from Escaping into the Open: The Art of Writing True. Elizabeth Berg is a “pantser,” that is she doesn’t plan out her books in detail beforehand. As part of the process, she collects objects, photographs, and sayings to spark her work. She keeps these “found objects” in a special project folder. Inspired by her system, I collected one word from each participant and the challenge was to incorporate all the words in a story. Our “found words” included: open, ecstatic, confused, cat, amazement. We had 12 minutes to write. Much to my “amazement,” some of the participants were able to incorporate the words into nonfiction stories. Since it was the first day of fall yesterday, I suggested we write about fall and try to use as many senses as possible. The smell of burning leaves, Halloween candy, and pumpkin pie. The taste of cider donuts. The sound of children laughing as they jumped into piles of leaves. The feel of the cold water while bobbing for apples. Descriptions of the colors of leaves. If you use one the prompts and post your work, feel free to tell us about it and leave a link in the comments.